Congratulations on your impending graduation! The faculty and staff of the Andrew Young School and I want to let you know that we are proud of your accomplishments and look forward to celebrating with you. 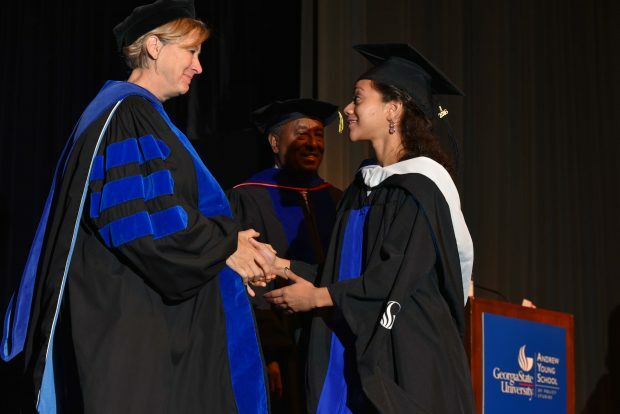 To mark this important milestone, you and your guests are invited to participate in the Andrew Young School’s Graduation Recognition Ceremony held at the end of the fall and spring semesters. Each will feature a keynote alumni speaker. While the university commencement exercises signify the official conferral of degrees, our Graduation Recognition Ceremony is an opportunity for the college to recognize its graduates by name and degree and celebrate this achievement. It also features a keynote alumni speaker. We encourage all graduating students to participate in both events, so please join us!